No outdoor patio is complete without a grilling area. And when it comes to choosing between the various types of grills, you're definitely going to want to pay close attention to the advantages of installing a built-in grill. 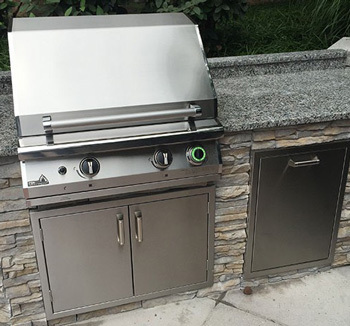 This type of grill maximizes your outdoor space by being built-in to the actual patio area and it has an aesthetic appeal that you won't find with any other type of grill. Did you know a built-in grill can increase your property value? If you intend to sell your home sometime in the future, an outdoor grill and kitchen area will serve as great selling points and are especially advantageous when listing your home during the spring or summertime. Built-in grills are available in many styles and finishes, giving you a wide range of options to choose from. No matter the aesthetic appearance you want to achieve, you can rest easy knowing there's a built-in outdoor grill to meet your preferences. Unlike other types of grills, a built-in grill is going to be a permanent fixture, meaning you're going to want to plan the installation carefully. Before you choose where to place it, you need to consider how easy it will be to run a power source to it, such as an electrical outlet and gas line. You'll also want to make sure proper clearance is allocated in your outdoor counters masonry enclosure. And if you plan to have accessories installed, like extra burners, drawers or an infrared rotisserie burner, this will impact where to have the built-in grill installed. Installing a built-in grill is not a do-it-yourself project. Because there is much involved regarding construction and establishing a power source, you'll need to contact a professional contractor to help you with the installation. A licensed contractor will also be able to help you decide the best installation spots are. You may find you have two or more spots to choose from, but once you take into account proper ventilation and your preferred accessories, you can narrow down your options to the best area. Another factor to consider when installing built-in outdoor gas grills is where you want your seating to be. You don't want the grill to be too close to your seating for a number of reasons. First and foremost, you want the grilling area to be away from the seating area due to safety reasons. Secondly, no one wants to sit close to the grill during the warmer months of the year because of the heat the grill is going to put off. If you know beforehand where you want your seating area to be, let the contractor know so they can choose the best installation spot accordingly. If you don't have an exact preference for the seating area, you can always decide where it's going to be once you pinpoint where the grill is going to be installed. The grill you are going to use is going to impact the best location to install it. Take for example you're going to have a large grill installed. This in itself may limit the locations where it can be installed. And as mentioned before, the power source will also impact where you can build it into the patio area. No matter the grill you choose, it's best to make sure it boasts several features, like a 60-minute gas shut-off timer. And if you like the look of stainless steel grills, then you're, of course, going to want to make sure outdoor kitchen appliances, like the stove and refrigerator, match your grill's stainless steel finish. When you opt for a Legacy built-in grill, you're going to enjoy features like an infrared rotisserie burner, a grill timer, stainless steel side shelves and drawers, and you can even opt for matching stainless steel beverage center. Legacy built-in grills are environmentally-friendly and thanks to the gas shut-off timer, they prevent fuel waste. When compared to charcoal grills, Legacy grills leave behind a much smaller carbon footprint, making them one a true friend to Mother Nature. AEI was founded in 1966 and has become a leader in the built-in grill industry. 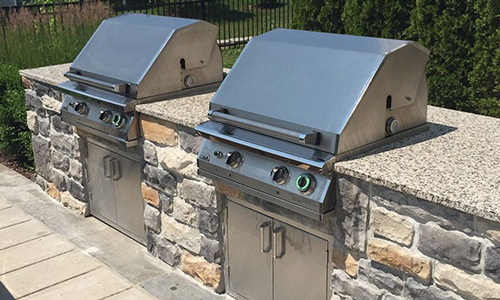 The company's Legacy Series all stainless steel grills make for an excellent choice when remodeling your outdoor patio area with a built-in grill. Shop AEI grills today.